Japa® 365 can be run with tractor PTO, electric motor or combustion engine and can be equipped with tires for legal road use. Hydraulics are optimized for the full professional use and allow user to cut and split simultaneously enabling high output and uptime for the machine. The well-designed hydraulic and mechanic power transmission can be heard from the pleasant sound of the machine. Cutting of Japa® 365 is designed together with the firewood professionals and their requirements. 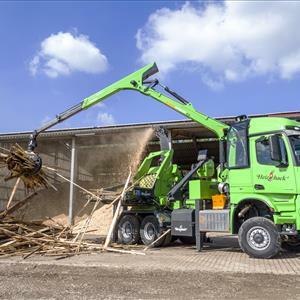 Infeed belt is the perfect angle and log holding device make sure that the log arrives cutting in the correct position and is held still during the cutting resulting undisturbed cutting and even end of the wood. Firewood length limiter is adjustable and will retract away during the cutting so that the firewood can drop freely in correct position to the splitting chamber. Chain lubrication works automatically and the separate transparent container for chain oil can be easily changed or filled without the tools. User can see the amount of the chain oil from the working position. When active safety guard is open user has easy access to the saw unit for chain and bar maintenance or replacement.